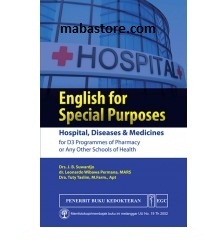 Buku English for Special Purposes Hospital, Diseases Medicines Pengarang Drs. J.B. Suwardjo, dkk Penerbit EGC, buku dapat anda pesan, beli pada toko Buku online kami dengan harga relatif murah. Untuk Pembelian, Pesan, Silahkan hubungi sales Suport kami. Pages xi + 192 hlm. English for Special Purposes: Hospital and Medicine contains materials for reading, vocabulary (special terms commonly used by the people working in medical environments), speaking and writing, equipped with exercises on the materials. The materials are arranged in a simple and systematic way to make the learners easy to learn. This book will be very useful for the students of pharmacy and medicine and those who work in the field of health such pharmaceutical workers or other paramedical ones. By learning the materials in this book, it is expected that the learners will find it easy to communicate with foreigners who need services in both our own country and abroad. 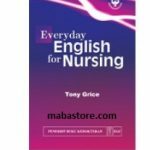 Tagged Baca Buku English for Special Purposes Hospital, Beli Buku English for Special Purposes Hospital, Download Buku English for Special Purposes Hospital, Harga Buku English for Special Purposes Hospital. Bookmark the permalink.